DVD: Widescreen 2.35:1/16x9; audio English Dolby Digital 5.1, French Dolby Digital 5.1; subtitles English, French; closed-captioned; single sided - dual layered; 47 chapters; Rated R; 156 min. ; street date 1/16/01. 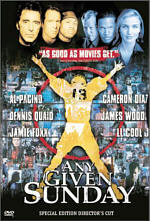 Supplements: Audio Commentary by Director Oliver Stone; Audio Commentary by Actor Jamie Foxx; “Full Contact: The Making of Any Given Sunday” 27-minute Featurette; Music Videos; Theatrical Trailer; Deleted Scenes; Audition Tapes and Screen Tests; Outtakes; Posters and Poster Concepts; Stills Gallery; Cast and Crew; DVD-ROM Features. Why have there been no truly great football movies? After all, one would think there’d be a slew of entries in the category, and at least a few should have been classics. Not only is football the most popular sport in America, but it would seem to be easily translated to film; the game resembles a war and has so many opportunities for drama and suspense that the connection should be natural. However, baseball has always been the cinematic winner. Though that sport’s relatively slow pace and lack of visual panache should make it dull and lifeless on the big screen, fine films like Bull Durham and Field of Dreams, prove the opposite to be true. It’s hard to think of a good movie about the gridiron, and most football-related offerings focus on college or high school sports. In fact, as an essay found in this disc’s DVD-ROM section states, it appears that the last major film to deal mainly with pro football was 1979’s North Dallas Forty. The last major film until 1999, that is, when Oliver Stone corrected the imbalance with his inconsistent but generally strong Any Given Sunday. Though Stone is known for his “issue-oriented” movies that generally aim at controversial subjects, AGS is the sight of him having some fun. While the story tries to be “hard-hitting” at times as it looks at some of pro football’s abuses, it’s really a very conventional tale of the old versus the new. At the start of the movie, “Cap” Rooney (Dennis Quaid), the legendary but aging quarterback of the Miami Sharks, goes down with an injury. When his fairly-incompetent backup also gets hurt, third-string QB Willie Beamen (Jamie Foxx) enters the game. He doesn’t win the contest, but he shows sparks of talent, and after the second-string QB fails to ignite the offense during the next game, Beamen gets the nod and becomes a sensation. The movie goes through a variety of subplots, but essentially it’s about balancing respect for the old with recognition of the new. Inevitably, Rooney is hurt by the way he seems to be cast aside while Beamen lets his new-found fame go to his head. Stuck in the middle of this all is head coach Tony D’Amato (Al Pacino), another aging veteran who wonders if his best is behind him. His situation is complicated by the “win at all costs” pressure of team owner/general manager Christina Pagniacci (Cameron Diaz); this young fire-brand wants to make a name for herself and provides an abrasive, unsentimental presence. By the end of the film, most of the parties’ stories wrap up with such heart-warming cleanliness that I thought Frank Capra stepped in to finish the movie. Really, though Stone uses very modern filmmaking techniques with his trademark quick-cutting and wide variety of visual styles, it’s an old-fashioned tale. The vet gets to go out with self-respect intact, the kid learns humility and the value of playing as a team, and the coach receives renewed life and vitality through all the experiences. The bad are punished and everyone goes home happy. AGS provides a very predictable story that is needlessly mucked up with too many subplots - it features an overabundance of characters - but I still liked it in the long run. My lack of affection for Stone has been documented; I thought his highly-acclaimed Platoon was nothing special, and I openly loathe his manipulations in JFK. However, AGS works mainly because Stone isn’t excessively concerned with reinventing the wheel. The subject matter is nothing new, and while Stone’s hyperactive visual style provides some semi-fresh kicks, I never felt like any form of innovation occurred here. And I didn’t care. Very few movies come across as something unique or original, so what becomes most important is how well the tales are told. AGS is a highly-professional and entertaining effort that could drag at times but remained largely exciting and compelling throughout its 156-minute running time. Stone hasn’t created a classic but I think it’s one of his more consistent and enjoyable works. The solid cast certainly helps. Pacino remains in his usual “hoo-hah” mode, but for all his bluster, he still is a strong, engaging presence. Foxx effectively portrays the variety of emotions Beamen experiences, and Quaid makes for a believable pro. Surprisingly, however, I thought Diaz did the best work of the bunch. It’s almost impossible to think of another “babe actress” who could handle a role like this without appearing absurdly out of place, but Diaz proves her acting chops as she stands up to the big boys and seems completely solid. She gets an unsympathetic character and makes her live and breathe during somewhat limited screen time. I won’t say her performance is a revelation, but it shows she can easily take on roles beyond her usual comedic milieu. I do have a few miscellaneous complaints about AGS. Because the NFL wouldn’t extend support for the film - too many controversial subjects like drug use - the movie creates its own league, the AFFA. I don’t recall hearing the acronym explained in the film; an article called it the “Association of Football Franchises of America”, but I’d like to think of it as the “American Fantasy Football Association”. While I understand the need to create this fictional league, Stone makes one major misstep when a character refers to the NFL’s Dolphins. This touch of realism actually makes the story less believable. If the AFFA was offered as a fake version of the NFL, I could accept it; I’d understand the need for the fictional teams and would simply regard the AFFA as an alternate universe’s NFL. However, since the film’s world also includes the NFL, that makes it more difficult for me to accept the AFFA. Had it been represented as a fledgling league, I could have believed it, but the movie leads us to view the AFFA as an equivalent of the NFL, with a similarly-glorious and lengthy history. I can’t make that leap. While I don’t think this stretch of reality made it impossible or even difficult for me to enjoy AGS, it did affect my suspension of disbelief. The introduction of the NFL caused me to be more critical of other aspects of the film’s factual basis, and this took me out of the story at times. Which leads me to my second criticism of AGS. If you watch this DVD’s documentary program, you’ll hear Stone and others discuss their absolute devotion to realism. Then why did the movie feature so many dopey mistakes? Scoreboards credit Touchdowns credit extra points before they occur. A player refers to how it feels to have eleven guys stare back at him in a huddle; unless he has an out of body experience, he only has ten people facing him in a huddle. A player gets a monetary bonus for reaching certain statistical levels; however, he doesn’t get to that point until the playoffs, and stats don’t count toward regular season totals at that time. There are also some continuity errors related to scoreboards, but I won’t worry too much about those, as they may have reflected changes in the production. However, I found the other various mistakes to disrupt my involvement in the story. I recognize personal inconsistencies in this regard; Chariots of Fire could have staged the Olympics on Mars for all I cared, but if a pro sports movie makes a tiny mistake, it drives me nuts. Anyway, none of these errors are huge, but they created small fissures in the overall impact of the story and made it harder for me to accept the film’s world. Any Given Sunday appears in an aspect ratio of approximately 2.35:1 on this single-sided, double-layered DVD; the image has been enhanced for 16X9 televisions. On this DVD, we find the same terrific transfer present on the original release; it’s a fantastic picture. Sharpness seemed very crisp and well-defined. Any softness or haziness was either intentional or part of the wide variety of source materials; no focus issues appeared due to other concerns. Between Pacino’s wrinkly forehead and a few striped shirts, I saw a few examples of moiré effects, but nothing significant. Print flaws appeared completely absent; other than during some of the aforementioned intentionally-problematic footage, I detected no signs of grain, scratches, hairs, speckles, nicks, tears or grit. Nearly as strong was the film’s Dolby Digital 5.1 soundtrack. The mix provided a wonderfully immersive sonic experience that helped translate the violent action of the game to the home theater environment. Although the forward channels offered the most distinct audio, I can’t say that they dominated the affair because the entire five-speaker spectrum is so active. While the surrounds mainly bolster the front channels, they do so tremendously strongly, and they also contribute a large amount of unique audio. Ultimately it’s a very involving mix that engulfs you with loudly overstated football effects and a combination of aggressive rap and rock music; AGS offers possibly the most active soundtrack I’ve heard for a movie that doesn’t involve war, disasters, or science fiction motifs. Quality generally appeared very positive as well. Due to Stone’s style, some dialogue got lost in the mix, but I felt certain this was intentional. Overall, speech sounded crisp and fairly natural, with no issues related to intelligibility. Effects were quite distinct and they packed a serious punch - literally. Whether the exaggerated crunch of the tackles, the roar of the crowd, or the sound of a buzz saw destroying a car, all of these aspects of AGS seemed clear and lacked any signs of distortion. Music appeared very bright and dynamic as well, with clean highs and solid bass. Actually, the whole mix boasted some excellent low end; if you’re lucky enough to have a subwoofer, it’ll get a nice workout during this movie. Considering all of the praise I heaped on this soundtrack, you may wonder why it received only an “A-“. There were two reasons for the slight subtraction of “points” from what should have been an “A”. First, I thought the audio betrayed a slightly metallic quality at times. Most of the track sounded natural and warm, but occasionally I thought it appeared mildly harsh. I also detected what seemed to be some bleeding of dialogue on one occasion. During Pacino’s locker room speech in Chapter 5, his voice seeps into both the right and left speakers as well as the center channel. At first I thought this may have been intentional, though it seemed strange; I found the effect distracting. However, since I never heard any similar bleeding during other similar scenes, I have to believe something else occurred. Frankly, neither this nor the mildly-metallic audio are a big deal, but they were significant enough to merit a minor reduction in my audio grade. On this new two-DVD release of Any Given Sunday, we find the same supplements available on the original DVD plus a few new ones. Key among the fresh extras are two audio commentaries available on disc one. The first comes from director Stone. This screen-specific track offers an involving listen that covers a fairly wide variety of subjects. Stone discusses the story itself more than usual, and at times his interpretation of the film gets tiresome; AGS isn’t one of his deeper efforts, and it really doesn’t require much explanation. Nonetheless, Stone is completely incapable of being boring, and he spends enough time on other topics to make the commentary worth a listen. It’s not one of his best efforts but I enjoyed it nonetheless. Also decent but unexceptional is the second commentary. The DVD’s case simply states that we find a track from a “star”, but it doesn’t specify which one, whereas the menu indicates we’ll hear from “Cast and Crew”. That’s not correct; we only get statements from actor Jamie Foxx. Although his commentary can be rather spotty and suffers from quite a few blank spots, Foxx offers some generally interesting remarks. Actually, his track seems erratic and could drag at times. However, he redeemed himself when he discussed his research into the lives of real players; on those occasions, Foxx brought a compelling perspective to the discussion. It’s not a great track but it deserves some attention. A couple of other extras round out the first DVD. We get a music-only track which initially didn’t seem to function as a true isolated score. This area’s menu lets you either select any of 16 different tunes, or it’ll allow you to “play all”. However, that latter option skips straight to Gary Glitter’s “Rock and Roll Part 2” and flits from section to section. However, if you want a real isolated score, just go to the “Languages” area and select “music-only track”. That’ll play the film in its entirety and give you every second of the movie’s music in Dolby Digital 5.1 sound. AGS features such an interesting mish-mash of tunes that it’s nice to be able to hear them on their own and better study Stone’s use of music. Another interesting feature is called Instant Replay. Here we get to jump straight to any of 10 different action scenes from the film. I doubt I’ll ever use it, but it’s a fun little addition nonetheless. In my original review, I griped because the Cast and Crew section only offered a few filmographies. The new DVD improves this situation slightly. Now we get rather solid biographies of Pacino, Diaz and Stone. However, the folks who wrote those nice entries must have been pooped when they finished them because we still only find filmographies for Foxx, James Woods and Quaid. Maybe when they release AGS a third time we’ll find full biographies for everyone. Lastly, the film’s theatrical trailer completes the first DVD. On disc two, we get a slew of other extras, all of which are divided into different areas: “Pregame”, “Halftime”, and “Postgame”. Some of these repeat materials found on the original release, starting with a 27-minute and five-second documentary called Full Contact: The Making of Any Given Sunday. While largely promotional in nature - it’s the kind of show you’d see on a cable channel in between movies - I thought the program provided a decent look at the film. Located in the “Pregame” section, we find interviews with both crew and cast plus some nice shots from the set and a plethora of movie clips. Stone blathers too much - such as his silly comment that after we see the kinetic visual style of AGS, we’ll never be able to watch a three-hour football game again - but I still enjoyed the documentary and thought it added to my enjoyment of the film. The remainder of the “Pregame” area offers test materials that involve Jamie Foxx. We get his “Football Home Video (Audition Tape)”, which essentially provides three minutes and 20 seconds of Foxx throwing the football. We also find two screen tests: “The Lunch” (76 seconds) and “Willie and Vanessa at the Cordoza Hotel” (121 seconds). Both are fun little looks at the casting process. “Halftime” consists entirely of music videos. One of these - LL Cool J’s “Shut ‘Em Down” - also appeared on the first DVD. The piece is mildly interesting but sticks to the usual lip-synch/movie clip formula and offers nothing special. The other two videos feature Foxx. We get “My Name Is Willie”, a one minute and 48 second piece that slightly expands upon the faux-video shown in the film, and “Any Given Sunday”. The latter lasts three minutes and 25 seconds and combines some scenic film clips with archival football footage. It’s darned dull. The “Postgame” area gets more interesting. Here we discover an archive of unused material. This starts with Deleted/Extended Scenes. A whopping 14 segments can be viewed, and these total 32 and a half minutes of video. These clips can be watched with or without commentary from Stone. Normally I view the scenes with the production audio first and then check them out with commentary, but in this case, you may as well check them out with Stone’s remarks during your initial viewing. He adds no statements for the first three scenes and only contributes a few tidbits for segments four, six, eight, ten, eleven, twelve, thirteen, and fourteen; even when he does speak, he offers surprisingly little information. The clips themselves are fairly interesting. They focus mainly on character moments, mostly for some parts that didn’t get a lot of attention in the finished film. As such, we see more of some of the other players. None of the scenes really needed to make the final cut, but they’re interesting and fun to watch nonetheless. An Outtakes/Gag Reel runs for four minutes and 10 seconds. This mixes some flubs with a fair amount of improvising. As such, it’s more fun than the usual goofs reel, especially during a great snippet in which Pacino and Woods chat on a plane trip. More unused footage appears during the “Football Outtakes Montage”. This eight minute and 25 second piece mainly consists of fairly generic game footage, but we also get some player and coach interactions as well. The latter make the section more interesting and fun. The final area that offers unused material is called Miscellaneous Landscapes and Outtakes Montage. This three minute and 20 second section includes the most stylized footage as we find lots of slow-motion game shots plus some exteriors. It’s the least interesting of the bunch but it still merits a look. The Art of Selling shows us the posters used to advertise AGS and it also lets us see a slew of unused concepts. The still frame presentation goes through 21 screens of ads; most of these display three posters per screen, but the first five show only one ad. I enjoyed this glimpse at the design process. Stills Gallery offers 122 photos. We get a nice mix of shots from the set, publicity pictures, and stills from the production. One nice touch: you can either advance through the photos frame by frame or let them play as one running 16 minute piece. The latter option adds background music and provides a good alternative method of presentation. One very cool addition appears in the “Script to Screen” section. Here we can observe a couple of different scenes in their various incarnations. We can see a shooting script, and we can look at Stone’s “director’s draft” with his own notes. For video options, we can view an early rough cut and the final product. Two scenes are available: “Tony and Willie” (from the jambalaya meal at Tony’s house) and “Game 3”. I enjoyed these sections as they gave me a nice look at the production process. The last option in the “Training Camp” is also very interesting. This is the “Virtual Edit Suite”, an area that allows you to check out one scene (“Tony Visits Christina”) through a variety of versions. “Meet the Editor” provides sound clips from editor Tom Nordberg as he discusses his experiences on the film and introduces the section to us. From there we can walk through “Assembled Dailies”, “Rough Cut without Music”, “Rough Cut With Music Added”, and “Final Cut”. We can view these with or without Nordberg’s comments as he talks about the processes. It’s another great feature that adds a lot to this DVD. One note about the “Virtual Edit Suite”: it has some technical problems. For one, some of the audio options are activated when you pass the mouse icon over them, and they’ll play even if different sound is running; that can get pretty annoying. More oddly, if you try to watch the “Final Cut” with Nordberg’s commentary, you’ll actually hear part of Stone’s track from the finished DVD. Why we don’t get remarks from Nordberg here is a mystery, especially since the area still says “Speak to the Editor”. In addition, most of the material from the AGS website appears on the DVD. This area includes much more extensive and detailed biographies for virtually all cast members and much of the crew, and lots of other fun features appear. It’s a solid site and I like the fact that most of its features appear here. All of the other extras on the DVD also appeared on the original release. The “Scoreboard” offers two major pieces. There’s “Touchdowns and Fumbles: Football Films Through the Decades”, a decent little essay that provides a short but satisfying overview of the history of football in the movies. The other section of the “Scoreboard” provides links to articles about AGS. If you enter this area, you’ll find a collection of 15 newspaper and magazine pieces. Some are reviews of the film whereas others are features about it. That ends the compelling DVD-ROM features. The “Special Online Events” links to the Warner Bros. Video web page. I found no mention of AGS on this site. Other links include ones to the WB Studio Store, WB Home Video, and WB Online. There’s also a “DVD Sampler” which lists some other WB releases in the Oliver Stone Collection: we find trailers and DVD details for Heaven and Earth, JFK Special Edition, AGS Special Edition, and Natural Born Killers. Finally, “Sound Hits” shows the track listing for the film’s soundtrack and links to the Atlantic Records site, where they’ll be happy to sell it to you. One final note about the 2-DVD edition of Any Given Sunday: it utilizes unusual packaging. Like virtually all Warner Bros. releases, it comes in a cardboard “snapper” case. This one resembles the snappers of the past but the left side folds out and creates two additional panels. In one of these - the far left one - we find the second DVD. It’s placed in a paper holder and inserted into a slot built in to the panel. This is the first time I’ve seen this kind of packaging, and while it seems a little cheesy, it’s no worse than the average snapper. Like all of Oliver Stone’s movies, Any Given Sunday is inconsistent and has a variety of flaws. However, it remains an interesting and generally fun film that provides a compelling look at America’s favorite sport. The DVD offers absolutely terrific picture and sound plus a nice variety of extras. It’s a solid component for both of the Oliver Stone Collection sets, and this new special edition release offers a thorough improvement over the original DVD due to its many additional supplements.